Well as I reported earlier, Minnesota Wild goalie Josh Harding suffered a foot injury that would sideline him indefinitely. 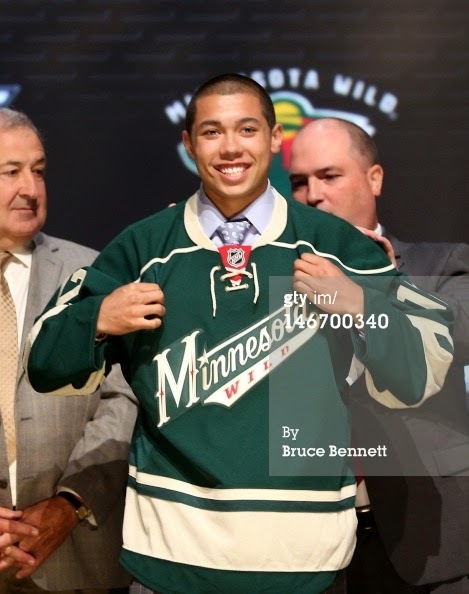 The Minnesota Wild have now suspended Harding for the cause of his injury being non hockey related. Other reports had said he broke his foot because of kicking a wall. However, any goalie question marks that the team has had just hours ago about who was going to be their number one going into home opener have finally been solved. It was announced about an hour ago that Darcy Kuemper has been signed to a two year, one way contract, averaging around $1.25 million a season. With this signing, the Wild are now able to focus, without any of the drama of who is going to be the number one goalie and, in my mind, finally solidified the position for the season, baring injury of course. All of the pieces are now in place for a very strong season, and a possible Stanley Cup run come April and May. I am hoping this is the beginning of the end for the stalled contract talks. The Minnesota Wild can't afford to let Darcy Kuemper get away. Incidentally, Kuemper could have filed for arbitration in July but didn't. Michael Russo, Star Tribune -- With training camp set to open next week, unsigned Wild goalie Darcy Kuemper is threatening to sign in Russia’s Kontinental Hockey League if the Wild doesn’t sign him to a one-year, one-way contract, his agent said Monday. “Basically, Chuck and I are stuck,” agent Jeff Helperl said of negotiations with Wild General Manager Chuck Fletcher. Fletcher did not comment on the negotiations. Helperl wants a one-year deal where Kuemper would be paid his NHL salary whether he plays in Minnesota or with the team’s American Hockey League affiliate in Des Moines. The Wild is offering a two-year deal where in the first year Kuemper would make a significantly lesser salary during the time he plays in Iowa. Helperl had a chance to file for arbitration July 5 but did not. That would have resulted in a neutral arbitrator awarding Kuemper, 24, a contract if one couldn’t be agreed upon prior. If the past is any indication of the future, Niklas Backstrom and Josh Harding have had their share of health issues and neither goalie has been able to play a full season that last two season. You have to figure that Kuemper is going to be up with the big club sooner rather than later. So, Minnesota Wild RFA goalie Darcy Kuemper is throwing a hissy fit. If I don't get my way, I am going to go to the KHL. Really, there's no options for Kuemper, he can sign with the Wild. I don't see another NHL team giving him an offer sheet. Time to sign a contract. TSN.CA -- Stuck in a crowded goaltending situation, Minnesota Wild restricted free-agent goaltender Darcy Kuemper could move overseas for his next contract if he isn't able to secure what he is looking for in the NHL. TSN Hockey Insider Bob McKenzie is reporting that the Wild would like to re-sign the Saskatoon, Saskatchewan native to a two-way contract, but coming off a strong playoff performance, Kuemper would prefer a one-way deal. The Wild already have both Niklas Backstrom and Josh Harding locked up heading into the season. The 24-year-old Kuemper is looking at his options in the KHL, but would want a deal with an out clause in case he is able to find an NHL deal to his liking. I said this last week on the Hockey Wilderness. Make no mistake about it, Kuemper is a good young NHL goalie, and he has tremendous upside. However, I don't think he has much room to command a big salary increase. I also think he has to surpass last season numbers to get a big bump in his pay check. Kuemper has played in 32 NHL games and has a (13-10-4, 2.37 GAA and a .915 SV%). Those are decent numbers, but they don't command a big salary increase, rather a modest bump. The Minnesota Wild's goaltending situation has been a subject of discussion. John Kreiser - NHL.com -- Who's the goalie? -- Niklas Backstrom, Josh Harding, Darcy Kuemper, Ilya Bryzgalov and John Curry (who won his lone late-season start) all had at least one victory in a season of tumult for Minnesota goaltenders . Harding was 18-7-3 with an NHL-best 1.65 goals-against average, but he didn't play after Dec. 31 because of the effects of his battle with multiple sclerosis. Backstrom struggled all season and played a total of 22:25 after Jan. 11 before season-ending abdominal surgery. Minor-league call-up Kuemper (12-8-4, 2.43 GAA) and Bryzgalov (7-1-3, 2.12 GAA), acquired in a trade on March 4, got the Wild to the playoffs. The question now is who fits where this season. Fletcher and coach Mike Yeo said they are content to go into training camp without a designated starter and see what happens in a competition between Backstrom, Harding and Kuemper (Bryzgalov remains a free agent). "We have three guys who are quality goaltenders, three guys who at points in the season have been our starting goaltender and played very good hockey," Yeo told NHL.com. "We're expecting some good competition in camp." If you were Chuck Fletcher, what would you do with your goalie situation? 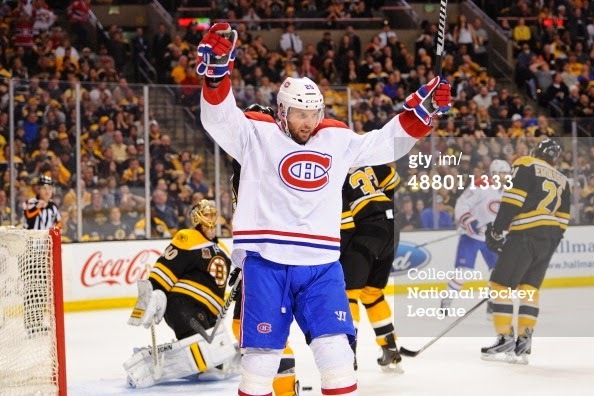 Are you tempted to sign Brodeur? If I were Chuck Fletcher I'd be extremely concerned about my goaltending situation. I know he said publicly that there will be training camp competition with Harding, Backstrom and Kuemper but I wouldn't feel too confident with that. That's why, since the trade deadline, many assumed Brodeur would be a great fit there. His sons also play at famed hockey prep school Shattuck St. Mary's in Fairbault, MN. Makes a lot of sense. But I think Brodeur is holding out for potentially an injury situation that opens a spot up. 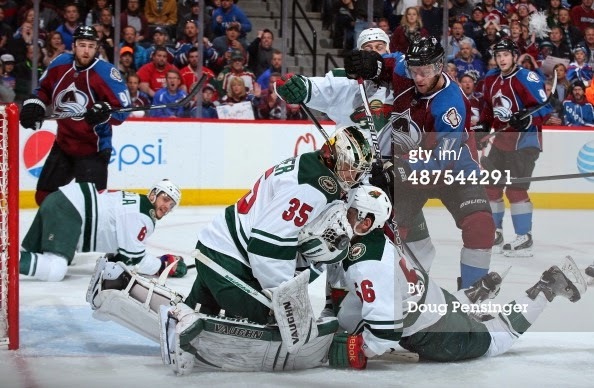 I think if there’s one question going into the 2014-15 season, it’s the Minnesota Wild’s goaltending situation. Niklas Backstrom and Josh Harding’s health issues are well documented. Darcy Kuemper has yet to sign a contract. 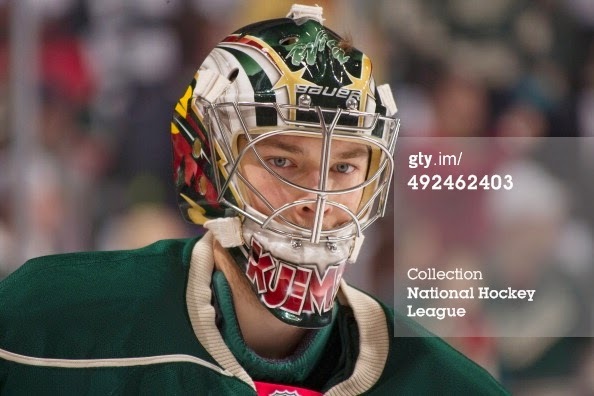 I am not so sure that the Wild want to add Martin Brodeur to the mix. The Minnesota Wild are having a tough time getting their top goalie prospect signed. Eventually, he's going to have to sing, because he's a restricted free agent. I don't think the Wild want this to drag out much longer. Michael Russo, Star Tribune --- A path toward a possible arbitration date would have at least guaranteed a settlement on a one- or two-year contract and would have assured that Kuemper would be signed by the commencement of camp Sept. 18. Now, a holdout — or at least the threat of one — is a possibility. “Darcy has great potential and played very well in stretches for us [last] season, but at the end of the day I think he’s played around 30 games in the NHL,” Fletcher said. “Usually this isn’t the time to fight for the big contract. We feel Darcy right now is trying to establish himself in the league, and once he does that it’ll be a little simpler to come up with terms. Kuemper, 24, went 12-8-4 last season with a 2.43 goals-against average and .915 save percentage. He came to the Wild’s rescue when goalies Niklas Backstrom (abdominal injury) and Josh Harding (multiple sclerosis) were sidelined. Kuemper’s camp, which battled the Wild three years ago before Kuemper signed his entry-level contract, appears to feel it has leverage because the Wild again plans to rely on Backstrom and Harding to be healthy next season. This is the best news that I have heard all week. Trading goalie Niklas Backstrom would free up need roster and cap space for Darcy Kuemper who emerged as the goalie of the future. During the 2013-14 season, Kuemper had a (12-8-4, .915 SV% and a 2.37 GAA). Michael Russo, Startribune -- Chuck Fletcher has a history of draft-day trades and spent last week working the phones. Fletcher has been shopping center Kyle Brodziak, sources say, and may be willing to retain salary and cap space to trade goalie Niklas Backstrom, who is recovering well from season-ending abdominal and hip surgeries. This story came out this past weekend, I think it’s a subject that’s worth some discussion. Minnesota Wild goalie Josh Harding was on fire on December 31, 2013, and then he was finished for the season due to symptoms from his Multiple Sclerosis. NHL.com -- Minnesota Wild goaltender Josh Harding is expected to be healthy and ready to play in time for training camp, general manager Chuck Fletcher said Friday. Harding left the Wild on Dec. 31 to deal with symptoms related to his multiple sclerosis. Before his illness forced him from the lineup, Harding was enjoying a breakout season, going 18-7-3 with a 1.65 goals-against average and .933 save percentage. After missing several weeks, Harding skated with the Wild during the Stanley Cup Playoffs but never made it back into the lineup before Minnesota was eliminated in the Western Conference Second Round. "I think his battles are well chronicled and well known. I think he's feeling well at this point in time," Fletcher said. "The goal for him is, much like last summer, to build up and get to a point where he'll be able to come into training camp and play well. There's been nothing that I've heard of to lead me to not believe that to be the case." Harding had All-Star numbers when he was playing. I also think if the Wild had Harding or Darcy Kuemper against the Blackhawks, the Wild might have advanced to the third round of the 2014 Stanley Cup Playoffs. The biggest question surrounding the Wild is what they’re going to do with the goaltending position. During the regular season, the Wild used five goalies. Four goalies played 12 or more games. Harding and Kuemper were the most consistent. Both goalies played over 25 games, and had save percentages of .915 or better with a winning percentage of at least (.580). One goalie I would like to see the Wild part ways with is the overpaid Niklas Backstrom, the guy was wildly inconsistent last year and has been hurt on and off the last few seasons. The Wild are on the hook for $3,416,667 a year for the two seasons. That’s too much money for a goalie that posted a (5-11-2 record, a 3.02 GAA and a .899 save percentage). Big hit by the Av's Jamie McGinn on Wild defenseman Nate Prosser. To add injury to insult, the Avalanche forward John Mitchell scores a weak goal on Minnesota Wild goalie Darcy Kuemper. s/t @CJZERO Checkout this shot by Chicago Blackhawks forward Brandon Bollig as he puts a snapshot off of Wild goaltender Darcy Kuemper's mask... Ouch!